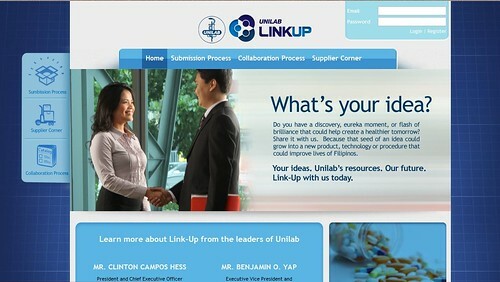 Unilab launches Unilab Link-Up, an open source program for innovations in healthcare. It is designed to be an online facility where innovators, suppliers, and consumers can submit their very own innovations whether its on health and wellness products, services, packaging, or manufacturing technology. Practically anyone in the country can now bring an idea to the market through Unilab Link-Up. The first of its kind for a Filipino pharmaceutical and healthcare company, the program also aims to provide for the needs of Filipinos in terms of health and wellness. Moreover, it also welcomes ideas on functional foods, packaging, manufacturing technologies, and wellness services. To submit an idea, one only has to visit and register at www.unilablinkup.com. An idea review body will then check the submission using a four-level review process. Corresponding rewards will be given to the innovation partner as the idea progresses from the review level until it is launched in the market. "Your ideas could be the start of something big," says Unilab President and CEO Clinton Campos Hess. So share it to the world through Unilab Link-Up and help change lives!